When this Bible arrived in the mail my three-year old said, “That book about God? You read to me now!? 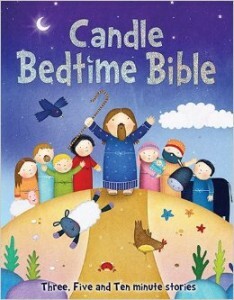 !” He was so excited, and has continued to be enthralled with this children’s story Bible. Amazon lists the age range as 3-5 years old, which seems to be about right. I was honestly surprised my little one took so well to this Bible because there are so many more words per page than most of our other children’s books. He really loves the stories and the illustrations, and does not seem to notice that each story has more words than pictures. He often asks to read multiple stories at a time. As a side note: While my three-year old loves the illustrations (and they certainly are cute), I thought it was strange that there are blond people (not typically Middle Eastern), but not dark-skinned people. Maybe this would not bother most people, but I thought that since diversity is prominently presented it should extend to skin-color as well as hair-color. This Bible is special in that it includes time estimations for three, five, and ten minute stories. We timed ourselves reading a few different nights, and found the estimations are pretty accurate for straight reading at a normal pace. It easily takes twice the time on the days my little one has questions or comments about the text or pictures, or random things going through his head that he wants to share, but that is to be expected. The Table of Contents is also well marked with the length and order of each story. This has become one of our favorite children’s Bibles. I received a complimentary copy of this book from Kregel Publications.